Due to Demonetization, RERA, GST, lack of consumer demand, increase of real estate prices, increase of MHADA premium and many other factors the Real Estate Industry is struggling to survive so some package from Government like packages are issued for sugar industry was expected. After four welcome changes suggested in income tax for Real Estate industry in the recent Interim budget 2019-2020 issued by Interim Finance Minister Piyush Goyal, Industry was awaiting reduction of GST rates for real estate industry to boost demand and thereby to boost sales. On the expected lines GST Council in the 34th meeting held on 19th March 2019 at New Delhi discussed the operational details for implementation of the recommendations made by the council in its 33rd meeting for lower effective GST rate of 1% in case of affordable houses and 5% on construction of houses other than affordable house. The promoters shall be given a one-time option to continue to pay tax at the rates (effective rate of 8% or 12% with ITC after taking 1/3 abetment of land) on ongoing projects (buildings where construction and actual booking have both started before 01-04-2019) which have not been completed by 31-03-2019. So Developers has to choose whether they have to continue with old rates of 8% for construction of affordable housing and 12% for housing construction other than affordable housing after taking 1/3 abatement for land and as Input Tax Credit is allowed in this option or they will have to go with new rates without Input Tax Credit. In metro cities like Mumbai where land value is very high Developers are getting maximum Input Tax Credit of 4% so then effective rate of GST works out to 4% (8% minus maximum 4% available Input Tax Credit) in affordable housing category and 8% (12% minus maximum 4% set off of available Input Tax Credit) in other than affordable housing category. Maximum 4% Input Tax Credit is arrived as Construction cost (Maximum will be works contract GST of 18% on contractor’s payment plus GST of 18% on architect services, project management consultancy fees and others, GST of 28% on Cement, GST of 18% on Steel etc). But above cost is very less as compared to overall project cost because major portion is land value plus interest cost on loan taken from Banks/NBFC/unsecured loan which is exempt from GST. Whereas new GST rate of 1% in case of construction of affordable houses and 5% on construction of houses other than affordable house. So net saving of 3% (8% after Input Tax Credit ((old method) as against 5% without Input Tax Credit (new method) in case of other than affordable housing category. 3% in case of affordable housing category(4% after Input Tax Credit (old method) as against 1% without Input Tax Credit (new method) ). Apart from net saving in new method as compared to earlier method, in earlier method Developer also has to face anti-profiteering complaints filed by the consumer or inquiries raised by the department. The National Anti-Profiteering Authority (NAA) has ordered Gurgaon-based Pyramid Infratech to refund over Rs 8.22 crore to 2,476 flat owners as it had failed to pass on the benefit of GST reduction to them. The order was passed on a complaint of profiteering filed by 109 home buyers of two affordable housing projects of Pyramid Infratech – Urban Homes, Sector 70A, Gurugram and Urban Homes, Sector – 86, Gurugram. The home buyers in their complaint had said that Pyramid Infratech had not passed on the benefit of lower tax arising out of availing of input tax credit (ITC) post roll out of the GST and hence indulged in profiteering. The Delhi High Court has however stayed an order by the National Anti-Profiteering Authority (NAA) against realty firm Pyramid Infratech. In a petition to the high court, counsel for the company, said the project was time-linked and not construction-linked. “The court while granting stay, acknowledged that the ratios used in the order need to be examined”. Any reduction in rate of tax on any supply of goods or services or the benefit of input tax credit shall be passed on to the recipient by way of commensurate reduction in prices. So threat of anti-profiteering clause will not be there in new rates of 1% GST for construction of affordable houses and 5% GST for construction of houses other than affordable houses relating to the passing to the consumers benefits of Input tax credit as Input Tax credit is not available. However threat of anti-profiteering clause relating to passing of benefits to consumers relating to reduction of rates in supply of goods or services will still remain as rates are reduced. But actually the said interpretation is not the intension of the government because as Developers were not passing benefits of GST regime to consumers so Government has brought reduced rates without Input Tax Credit so customer (receiver of service) does not have to pay more tax due to introduction of GST so relevant clarification should be issued by the Government or GST Council else language of Section 171 (1) will still create problems to the Developers. In metro cities like Mumbai value of house up to RS 45 lakhs will be a remote possibility. But for affordable houses GST rate of 1% without Input Tax Credit is a welcome change which will surely result into increase of demand and sales. (a) All houses other than affordable houses in ongoing projects whether booked prior to or after 01.04.2019. In case of houses booked prior to 01.04.2019, new rate shall be available on installments payable on or after 01.04.2019. Condition (c) is a welcome condition as many redevelopment projects involve few shops or offices which are less than 15% of total carpet area of the redevelopment projects so just because few shops or office premises are there so that such projects will not be outside the ambit of concessional rate of 5%. According to my view said condition should also be there in the affordable category so Real Estate Industry can represent the Government so they GST Council can carry out necessary changes relating to the same. Condition (b) mentioned above is brought by the GST Council because as Concessional rates are available because no Input Tax Credit is available so that it should not happen that Developers will start buying materials or start taking services of un registered persons else there will be a huge dent on the Government collection of GST plus one of the objective of GST is to increase tax net which will not be achieved. So if Developers are resorting to such practices then they have to pay GST on reverse charge basis on shortfall of 80% inputs and input services purchased from un registered persons so reverse charge GST will cover shortfall of GST in such cases. 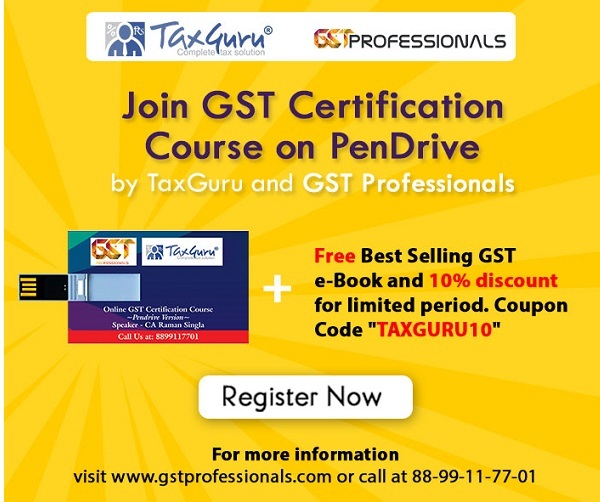 However to calculate 80% of inputs and input services only exclusion is given for capital goods, TDR/ JDA, FSI, long term lease (premiums), so the same can also be subject matter of disputes between the Developers and GST Department. Because major portion of cost of Developer is Interest cost/discounts on deposits, loans or advances which is exempt from GST as per entry no 27 of Notification No. 12/2017- Central Tax (Rate) dated 28-06-2017. In case of redevelopment projects major costs are Corpus payment to society/members/tenants, Displacement Compensation (Rent) payable to members/tenants which can be considered as relating to land so the same is also outside the ambit of GST. The same is because Schedule III lists down activities or transactions which shall be treated neither supply of goods nor a supply of services Para 5 covers Sale of land and, subject to clause (b) of paragraph 5 of Schedule II, sale of building. So GST council should come out with necessary changes and state that apart from above exceptions if few goods or services are exempt from GST then the same should also be excluded for the purpose of calculating 80%. The transition formula approved by the GST Council, for residential projects (refer to paragraph 4(ii)) extrapolates ITC taken for percentage completion of construction as on 01.04.2019 to arrive at ITC for the entire project. Then based on percentage booking of flats and percentage invoicing, ITC eligibility is determined. Thus, transition would thus be on pro-rata basis based on a simple formula such that credit in proportion to booking of the flat and invoicing done for the booked flat is available subject to a few safeguards. Supply of TDR, FSI, long term lease (premium) of land by a landowner to a developer shall be exempted subject to the condition that the constructed flats are sold before issuance of completion certificate and tax is paid on them. Exemption of TDR, FSI, long term lease (premium) shall be withdrawn in case of flats sold after issue of completion certificate, but such withdrawal shall be limited to 1% of value in case of affordable houses and 5% of value in case of other than affordable houses. This will achieve a fair degree of taxation parity between ‘under construction’ and ‘ready to move’ property. The liability to pay tax on TDR, FSI, long term lease (premium) shall be shifted from land owner to builder under the reverse charge mechanism (RCM). . Majority of the projects are getting Occupancy Certificate or Part Occupancy Certificate but getting Completion Certificate is a challenge. Many projects are over but they have not got occupancy certificate also so in those cases Developer can argue that as Completion Certificate is not received so GST liability on TDR, FSI, long term lease (premium) of land under RCM has not triggered. Above Decisions are expected to address the problem of cash flow in the sector. The decisions of the GST Council have been presented above in simple language for easy understanding along with my comments. The same would be given effect to through Gazette notifications/ circulars which alone shall have force of law. The promoters shall be given a one-time option to continue to pay tax at earlier rate with Input Tax Credit benefits on ongoing projects (buildings where construction and actual booking have both started before 01-04-2019) which have not been completed by 31-03-2019 or to pay tax at new concessional rate of tax without Input Tax Credit for affordable houses or construction of residence other than affordable houses. If option is not exercised within the prescribed time then new rates shall apply. Apart from net saving in new method as compared to earlier method, in earlier method Developer also has to face anti-profiteering complaints filed by the consumer or inquiries raised by the department. Threat of anti-profiteering clause will not be there in new rates of 1% GST for construction of affordable houses and 5% GST for construction of houses other than affordable houses relating to the passing to the consumers benefits of Input tax credit as Input Tax credit is not available. However, threat of anti-profiteering clause relating to passing of benefits to consumers relating to reduction of rates in supply of goods or services will still remain as rates are reduced and language of Section 171 (1) will still create problems to the Developers. The new concessional tax rates shall be available if no Input Tax Credit has taken and 80% of inputs and input services (other than capital goods, TDR/ JDA, FSI, long term lease (premiums) shall be purchased from registered persons. On shortfall of purchases from 80%, tax shall be paid by the builder @ 18% on RCM basis. However, Tax on cement purchased from unregistered person shall be paid @ 28% under RCM, and on capital goods under RCM at applicable rates. However to calculate 80% of inputs and input services only exclusion is given for capital goods, TDR/ JDA, FSI, long term lease (premiums), so the same can also be a matter of disputes between the Developers and GST Department. For a mixed project transition shall also allow ITC on pro-rata basis in proportion to carpet area of the commercial portion in the ongoing projects on which tax will be payable @ 12% with ITC even after 1.4.2019 to the total carpet area of the project. The same is because concessional rates of GST will be applicable only for construction of residential project and old rate with ITC shall continue to apply for commercial construction. Supply of TDR, FSI, long term lease (premium) of land by a landowner to a developer shall be exempted subject to the condition that the constructed flats are sold before issuance of completion certificate and tax is paid on them. Exemption of TDR, FSI, long term lease (premium) shall be withdrawn in case of flats sold after issue of completion certificate, but such withdrawal shall be limited to 1% of value in case of affordable houses and 5% of value in cases other than affordable houses. The liability to pay tax on TDR, FSI, long term lease (premium) shall be shifted from land owner to builder under the reverse charge mechanism (RCM) in respect of flats sold after completion certificate & the RCM liability on the Builders will arise on the date of issue of completion certificate. In case of redevelopment , will GST be attracted towards constructing flats for existing flat owners?